After two extensions, "No Man's Land" and "Waiting for Godot" have completed a legendary run on Broadway. Ian McKellen and Patrick Stewart starred on Broadway in a limited season repertoire of Harold Pinter's No Man's Land and Samuel Beckett's Waiting for Godot, directed by Sean Mathias. Internationally acclaimed for their performances on stage, screen and television, McKellen ("Estragon/Spooner") and Stewart ("Vladimir/Hirst") returned to Broadway playing in a rotating schedule of two of the most iconic plays of the 20th Century. Distinguished actors Billy Crudup ("Foster/Lucky") and Shuler Hensley ("Briggs/Pozzo") co-starred. Waiting for Godot played a critically acclaimed, sold-out run in London's West End in 2009. Prior to Broadway, No Man's Land played Berkeley Rep in summer 2013. Designs for the productions included sets and costumes by Stephen Brimson Lewis (twice Tony-nominated for Indiscretions) and lighting by Peter Kaczorowski (a Tony Award winner for Contact and The Producers). Ian McKellen made his Broadway debut in Arbuzov's The Promise in 1967 and won the Tony Award for his performance in Amadeus in 1981. Patrick Stewart first appeared on Broadway in Peter Brook's production of Shakespeare's A Midsummer Night's Dream in 1971 and won the Drama Desk Award for A Christmas Carol in 1992. The two actors have appeared together on stage before. In 1977 they performed in the premiere of Tom Stoppard's Every Good Boy Deserves Favour. Both actors have received knighthoods for their services to drama and the performing arts. On the announcement, Ian McKellen said "British actors are used to playing in repertory, whether for the National Theatre or the Royal Shakespeare Company. We enjoy the challenge of variety, and audiences, myself included, enjoy watching a group of actors in contrasting roles. We hope, at least once a week, to give Broadway audiences the chance of seeing Beckett and Pinter on adjacent nights, perhaps even on the same day." "All my acting life, I have been drawn to the principles and practice of a 'company,' and working with familiar, trusted friends/colleagues," said Patrick Stewart, "whether in British repertory theatre, The Royal Shakespeare Company, Star Trek or X-Men. It's not that strangeness/newness isn't exciting - it is - but when there is a common language and experience, then the unpredictable can happen. So, Ian McKellen, Sean Mathias, Stephen Brimson Lewis, Sam Beckett, Harold Pinter- plus two yet-to-be cast actors - it feels good." In Harold Pinter's No Man's Land we wonder if two writers, Hirst (Patrick Stewart) and Spooner (Ian McKellen) really know each other, or are they performing an elaborate charade? The ambiguity - and the comedy - intensify with the arrival of two other men. Do all four inhabit a no-man's-land between the present and time remembered, between reality and fantasy? No Man's Land was first produced in 1975 by the National Theatre in London with John Gielgud playing Spooner and Ralph Richardson as Hirst. No Man's Land debuted on Broadway a year later. Samuel Beckett's Waiting for Godot follows two consecutive days in the lives of Vladimir (Patrick Stewart) and Estragon (Ian McKellen), who divert themselves by clowning around, joking and arguing, while waiting expectantly and unsuccessfully for the mysterious Godot. Waiting for Godot premiered in Paris in 1953, followed by London in 1955 and eventually opened in New York in 1956. Director Sean Mathias added "In Waiting for Godot, two men exist in a universe that is both real and imagined - a place where time does not always advance towards a future. And as the two men wait, two outsiders enter to disrupt that universe. In No Man's Land, two men inhabit a land that is neither here nor there - a land where time and memory play unreliable tricks. And as these two men converse, two other men who are both familiar and unfamiliar enter this same land with unnerving effect. "Beckett and Pinter - the idea of connecting these two giant authors by examining two of their most remarkable plays with the same company of four actors portraying the writers' eight characters is one of the most exhilarating challenges I have yet faced in my work." 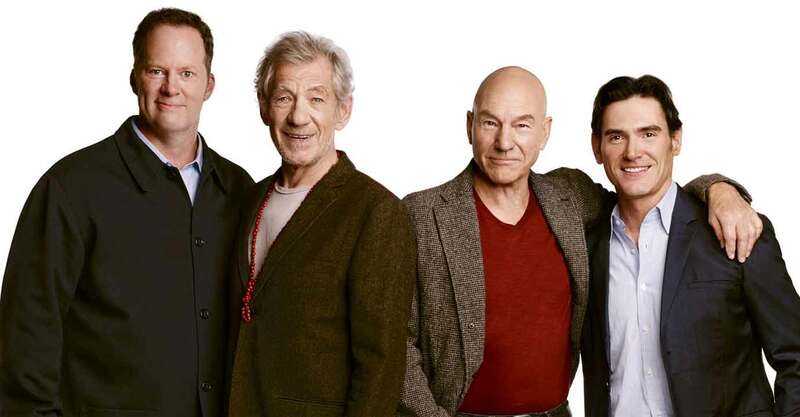 Rehearsals for the unprecedented repertory began this summer after Ian McKellen and Patrick Stewart finished filming the next installment of the X-Men film series in their signature roles of Magneto and Professor Xavier. No Man's Land and Waiting for Godot were produced on Broadway by Stuart Thompson and NOMANGO Productions. Patrick Stewart (Hirst / Vladimir) most recently appeared on stage in Edward Bond's Bingo at the Young Vic and Chichester Festival Theatre; and as Shylock in a 2011 RSC production of The Merchant of Venice, directed by Rupert Goold. His previous collaboration with Goold, in the title role of Macbeth, played Chichester, London, BAM and then Broadway, where he earned a Tony nomination. Stewart is an Honorary Associate Artist with the RSC, having appeared in over 60 productions including, most recently, a 2008 production of Hamlet, opposite David Tennant; and 2005 repertory productions of Antony and Cleopatra and The Tempest. In 1978, he won an Olivier Award for his performance in Peter Brook's production of Antony and Cleopatra and was nominated for his role in The Merchant of Venice. He also appeared in the now legendary Peter Brook production of A Midsummer Night's Dream. On Broadway and West End stages, Patrick has appeared in A Life in the Theatre, The Master Builder, The Ride Down Mt. Morgan and The Tempest. For his acclaimed solo production of A Christmas Carol, Stewart played over 40 characters, garnering an Olivier, Drama Desk and What's on Stage Award. Perhaps best known as Captain Jean-Luc Picard of Star Trek: The Next Generation, both on television and film, and as Professor Charles Xavier from the X-Men films, Stewart has also enjoyed a successful film and television career, earning Golden Globe, Emmy and SAG Award nominations. Screen appearances include King of Texas, Jeffrey, Dune, Excalibur, LA Story, Robin Hood: Men in Tights, Conspiracy Theory, Extras (for which he earned an Emmy nomination), The Lion in Winter, I, Claudius and Tinker Tailor Soldier Spy. His vocal talents have been heard on The Simpsons, American Dad and Family Guy, and as narrator of Seth MacFarlane's hit comedy, Ted. Stewart recently completed production on the Israeli film Hunting Elephants and the film adaptation of Stephen Belber's Match and will soon reprise his role as Professor Xavier in X-Men: Days of Future Past. Billy Crudup (Foster / Lucky) has appeared on Broadway in the 2011 revival of Arcadia (Tony Award nomination), The Coast of Utopia (Outer Critics Circle nomination, Drama Desk nomination, Tony Award), The Pillowman (Tony nomination), The Elephant Man (Outer Critics Circle nomination, Tony nomination), The Three Sisters (Drama Desk nomination), Bus Stop and the original production of Arcadia (Theatre World Award, Outer Critics Circle nomination, Clarence Derwent Award). Off-Broadway credits include The Metal Children, The Resistible Rise of Arturo Ui, Measure for Measure and Oedipus. His film credits are Rudderless, The Convincer, Too Big to Fail, Eat Pray Love, Watchmen, Public Enemies, Dedication, Mission Impossible III, Trust the Man, The Good Shepard, Stage Beauty, Big Fish, Almost Famous, Jesus' Son (Best Actor Award, Paris Film Festival; Independent Spirit Award nomination), Sleepers, Everyone Says I Love You, Grind, World Traveler, Charlotte Gray, Princess Mononoke, The Hi-Lo Country, Waking the Dead, Inventing the Abbotts, Without Limits (National Board of Review Award) and Moment Avenue. Billy is a graduate of the University of North Carolina at Chapel Hill (BA) and New York University (MFA). Shuler Hensley (Briggs / Pozzo) will be seen in the Kennedy Center's production of The Guardsman, directed by Gregory Mosher this summer. He has previously appeared on Broadway as The Monster in Young Frankenstein (also the U.S. National Tour), Kerchak in Tarzan, Jud Fry in Oklahoma! (also at The National Theatre and London's West End - Tony, Drama Desk, Outer Critics Circle and Olivier Awards) and Javert in Les Misérables. He has been seen Off-Broadway in Fiorello! (Encores! ), The Whale (Obie and Lucille Lortel Awards; Outer Critics Circle, Drama League and Drama Desk nominations), Silence! The Musical, Sweet and Sad (Drama Desk Award for Outstanding Ensemble), That Hopey Changey Thing and The Great American Trailer Park Musical. His other credits include Ghost Brothers of Darkland County (Alliance Theatre), All About Us (Westport Playhouse), The Phantom in The Phantom of the Opera (Hamburg, Germany) and The Most Happy Fella (American Songbook/Lincoln Center). Opera appearances include Wozzeck (Curtis Institute of Music) and Regina (Kennedy Center). Shuler recently appeared in Carousel at Avery Fisher Hall with the New York Philharmonic, which was nationally broadcast on PBS. Other orchestra engagements include the Philadelphia Orchestra, San Francisco Symphony Orchestra and the New World Symphony Orchestra. Shuler's TV credits are The Americans, Ed, Deadline, Gary Powers, Law & Order: SVU and Criminal Intent, and The Jury. His film appearances include After.Life; The Legend of Zorro; Van Helsing; The Bread, My Sweet; and Opa! Upcoming film projects are Odd Thomas and Cruiser. Proud member of Actors' Equity Association. This past year, Shuler was awarded the "Stage Performance of the Year" by New York Magazine in recognition for his work in The Whale. Sean Mathias (Director) Mathias's productions have received global acclaim from Northern Ireland to New Zealand. They have visited many international cities including Paris, Sydney, Cape Town, Los Angeles, New York and London and have played on various stages including the Royal National Theatre, the Music Centre Los Angeles, the Kennedy Centre Washington DC, the Sydney Opera House, the Market Theatre Johannesburg, the Oliver Tambo Hall in the township of Khayelitsha, South Africa as well as the London Fringe, the West End and Broadway. He has directed classic plays by Anhouilh, Beckett, Chekhov, Cocteau, Coward, De Filippo, Ibsen, Shakespeare, Sophocles, Strindberg and Williams as well as works by contemporary writers Samuel Adamson, Pam Gems, Richard Greenberg, Ronald Harwood, Rebecca Lenkiewicz, Edna O'Brien, Bernard Pomerance, Martin Sherman and Stephen Sondheim. He has won an Edinburgh Fringe First Award, a Prix de la Jeunesse at the Cannes Film Festival, a Critics' Circle Award and an Evening Standard Award as well as nominations for the Olivier and Tony Awards. He was Artistic Director of the Theatre Royal Haymarket for 2009/2010 where his legendary production of Waiting For Godot starring Ian McKellen and Patrick Stewart smashed all box office records and the debut production of Breakfast at Tiffany's enjoyed a sensational run. He directed Breakfast at Tiffany's on Broadway this spring. He is the author of the plays Cowardice, Infidelities, A Prayer For Wings, Poor Nanny, Swansea Boys and of the screenplay The Lost Language of Cranes. He directed the movie Bent.